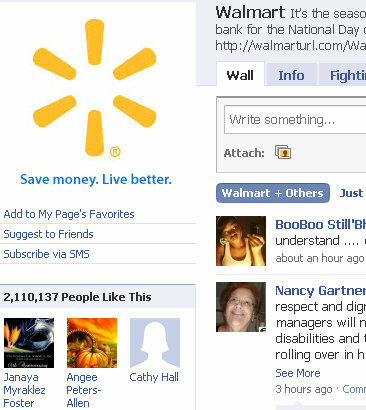 Why Isn't Wal Mart Using Facebook Places & Deals? Why Isn’t Wal Mart Using Facebook Places & Deals? I live very close to a Wal Mart Supercenter, and last night my wife had me run to pick up a couple of things for breakfast this morning. After I put the bananas, orange juice, and raspberry danish in my shopping cart, I headed over to the electronics to see if the iPad was on display yet – and much to my disappoint it wasn’t. So as I was walking up to the front to pay for my items, I thought – wow… Wal Mart is amazing in that I can pick up orange juice and shop for an iPad all in the same place. At that exact moment, another thought popped into my head that went something like this > wow, I bet Wal Mart is already using Facebook Places and Facebook Deals to drive traffic to this store and promote sales. So I fired up my Facebook App on my iPhone to see how masterfully integrated Facebook Places and Deals was being utilized by Wal Mart. Wal Mart didn’t even show up under places! WHAT??? HOW CAN THIS BE??? The master of merchants… the everyday low prices… WAL MART… is not using Facebook Places and Facebook Deals? Wal Mart already has a Facebook Fan Page, so it’s definitely not their lack of exposure on leveraging Facebook – especially considering the fact they have over 2 million fans on Facebook!!! Needless to say I was completely shocked and dismayed by this discovery. Could it be that big box retailers have yet to discover the power of Facebook Places and Deals? Are all Wal Marts like this, or is it just this one? I don’t know… but I do know that at least my local Wal Mart is missing out on a serious marketing opportunity to push product even faster out their doors.